Dr.Pairach Piboonrungroj was born on 5 June 1983 (the same date of the birth of Adam Smith, but 260 years after ). He is now the associate dean of the College of Maritime Studies and Management, Chiang Mai University. Dr.Pairach studied a PhD in Logistics and Supply Chain Management at the Logistics Systems Dynamics Group of Cardiff University. 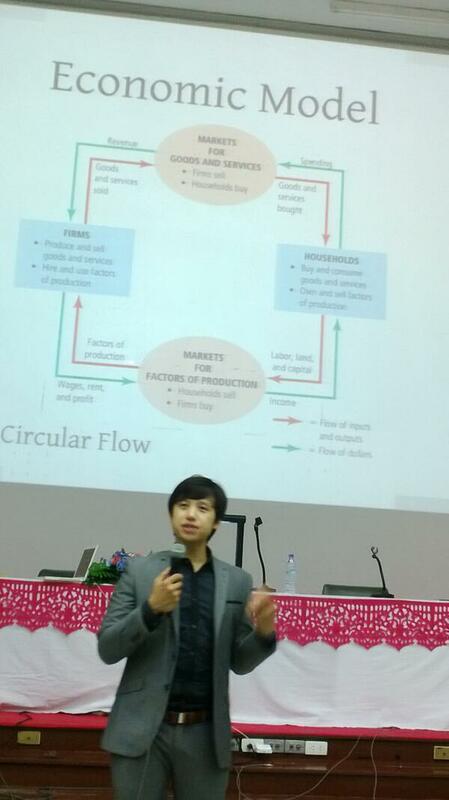 His multiple-awarded PhD research aims to explain relationships in tourism supply chain via lens of transaction cost economics using a statistical technique called structural equation model (SEM). He was awarded an MSc (distinction) in Logistics and Operations Management from Cardiff University in 2009. His studies in Cardiff have been fully supported by the Royal Thai Governments scholarship, which was awarded from a national competition. In 2005, he got a Bachelor of Economics (First-class honour) from Chiang Mai University (Thailand). Dr.Pairach has involved in a number of research projects in logistics and supply chain management in various industries such as tourism, business events, creative economics and logistics as well as consultancy works to various organisations such as The World Bank and Thailand Ministry of Tourism and Sports. He is also an ad-hoc reviewer for several journals and conferences such as Tourism Management, European Journal of Operational Research, Journal of Service Management, Academy of Management Conference, and British Academy of Management Conference. Dr.Pairach is also an R enthusiast, co-founder of R User Groups in Cardiff (Cardiff-R) in the UK and Chiang Mai (ChiangMaiR), in Thailand. His underlying research theme is an application of economics theories and techniques to logistics and supply chain management. Economic sectors Dr Pairach has been studied include tourism, ICT, energy and herbs. The 6th Samaggi Academic Conference (SAC6), UCL, London, 25 January 2013. Section away day, Logistics and Operations Management Section, Cardiff University, 10th January 2012. 18th Annual EurOMA Conference. Cambridge University, United Kingdom, 3rd -6th July 2011. The study trip project (to France and Switzerland) to enhance the visions of outstanding students from different disciplines. Supervising the database management in the World Bank project associating with Lao’s Poverty Reduction Fund and Lao’s National Statistics Centre. Conducting, decoding and analysing over ten large-scale surveys in the fields of tourism economics and logistics in Thailand and aboard. Below is the word-cloud of my publication title created by tagul. Piboonrungroj, P. 2011. 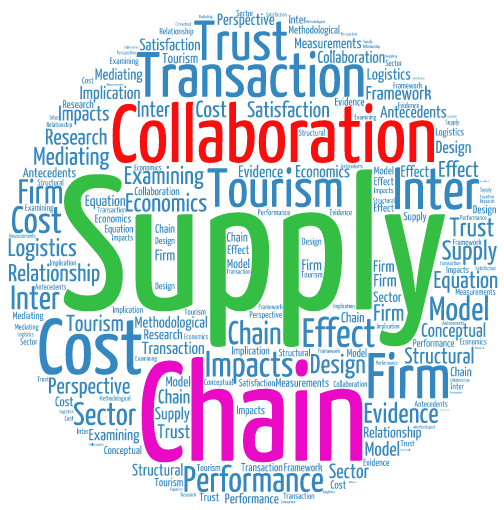 Impacts of supply chain collaborations on inter-firm trust, performance and relationship Satisfaction: A transaction cost economics perspective. Doctoral Symposium of the 25th Annual Conference of the British Academy of Management, Aston Business School, United Kingdom, 13th-15th September. Piboonrungroj, P., Williams, S.J. and Disney, S.M. 2011. Examining mediating effect of transaction cost in supply chain relationship. The 25th Annual Conference of the British Academy of Management, Aston Business School, Birmingham, United Kingdom, 13th-15th September. Piboonrungroj, P. 2011. Transaction costs in supply chain collaborations: Measurements and antecedents. The First NIE doctoral Colloquium. Network of Industrial Economists, University of Nottingham Business School. 22nd June 2011. Piboonrungroj, P. and Disney, S.M. 2009. Supply Chains Collaboration in Tourism: A Transaction Cost Economics Perspective, Second Biennial Conference of the International Association for Tourism Economics, Chiang Mai, Thailand, 11-13 December. Piboonrungroj, P. 2009. Methodological Implication for the Research Design in Tourism Supply Chain Collaboration, 18th Summer Research Academy European Doctoral Programmes Association for Management and Business Administration (EDAMBA), Soreze, France, 23rd – 29th July. Piboonrungroj, P. and Disney, S.M. 2009. Tourism Supply Chains: A Conceptual Framework. PhD Network Conference, Nottingham, UK. 1-3 July, pp.132-149.